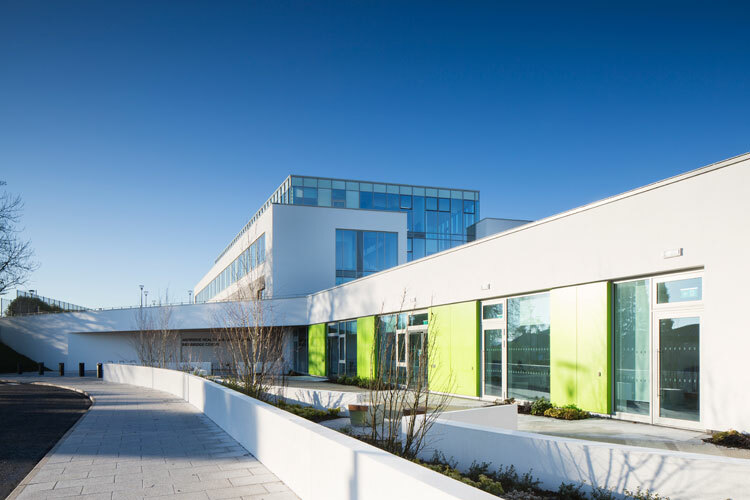 A palette of different materials provided by Sto has helped transform a successful architectural design competition entry into an award-winning community healthcare centre in Northern Ireland. The company’s superior StoTherm Classic external wall insulation system, StoRend Cote render and StoLotusan render finish were used on the Banbridge Health and Care Centre in County Down, by Kennedy FitzGerald Architects in association with Avanti Architects. 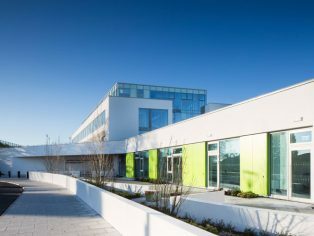 The completed building has won an unprecedented number of awards from both the healthcare and architectural communities. Damien Day of Kennedy FitzGerald Architects: “The architectural design was a direct response to the steeply sloping site and the client’s brief to bring three distinct functional zones together in one building. The new health centre provides community outpatient facilities, day-care accommodation for adults with disabilities and also support accommodation for the Southern Health and Social Care Trust. It has been designed with quality materials and robust detailing to ensure the building serves the community for many years to come”. The design is distinctive but restrained and elegant, with long, low profile elevations and a lawn roof merging with the site topography and landscape. It blends with its surroundings and has a restrained palette of external materials that provide a sophisticated background to planted courtyards and gardens. “We wanted a strong robust exterior finish with clean lines and seamless surfaces that would show off the planted gardens and courtyards, and resist adverse weathering including algae growth. The Sto finish was exactly what we were looking for”. StoTherm Classic external wall insulation was used to provide high levels of thermal insulation for the building. This entirely cement-free system offers up to 10 times greater impact resistance than a cementitious system, and so will allow the building to retain its attractive appearance. It can also be installed without the need to accommodate joints. In wall areas not requiring additional insulation, the building was rendered with StoRend Cote – a cost-effective, weatherproof and low maintenance render system designed for substrates with minimum mechanical movement. StoLotusan was then applied in white, to create a crisp and clean finish. StoLotusan is the only render finish available that provides a patented Lotus-Effect®, for unbeatable water and dirt repellence, combined with outstanding protection against algae growth. The combination of Sto products, which were all installed by the Newry-based specialist applicator, GVI Facades, created a seamless and contemporary façade which was very much in line with the original architectural vision for the project. “The high-quality Sto finish ensures that the building façade provides a strong first line of defence which will resist weathering and require minimal maintenance over the building’s lifespan. We are delighted with the completed building façade and the technical support and quality products provided by Sto”.